(Jan 31): The crisis surrounding HNA Group deepened after it emerged that the Chinese company’s ability to repay its debt will face a potential shortfall of at least 15 billion yuan ($3.1 billion) in the first quarter. The sprawling conglomerate warned major creditors about its financial status in a meeting in Hainan last week, though it also said that the pressure will probably ease in the second quarter as the group steps up asset disposals, according to people familiar with the matter, who asked not to be named because the discussions are private. The news illustrates the extent of HNA’s liquidity challenges -- and the urgency behind it -- after the conglomerate spent tens of billions of dollars on debt-fueled investments to transform a little known airline into one of China’s biggest business behemoths. The scale of the funding gap may also deepen concerns about the viability of the group, which owns stakes in everything from Deutsche Bank AG to Hilton Worldwide Holdings Inc., as it faces scrutiny worldwide from regulators and investors. "It’s not going to be easy to sell assets in such a short time to cover the shortfall so the decisions made by banks will be crucial in the coming weeks," said Linus Yip, Hong Kong-based strategist with First Shanghai Securities "HNA can only hope that banks will grant it new funds." HNA representatives didn’t respond to a request for comment for this story but the company has repeatedly said in recent months that it’s in good financial condition and that its debts are manageable. In December, board director Zhao Quan said that any tightness in funds would be temporary and that the group wouldn’t default on any borrowings in the coming year. HNA has become very big. 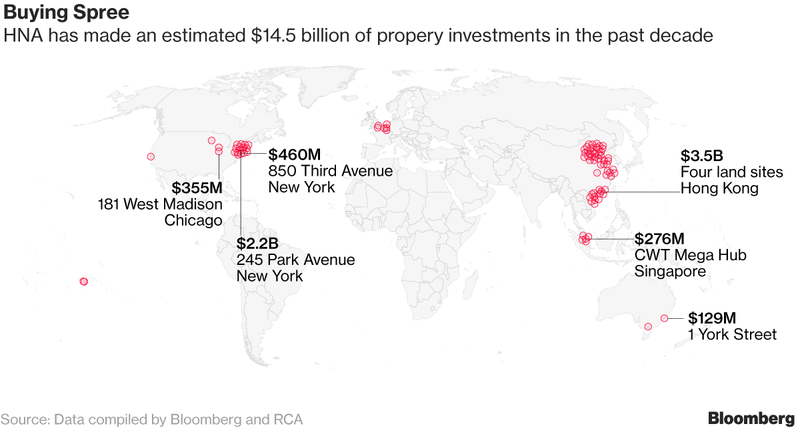 It had US$190 billion ($248.2 billion) of assets -- more than at American Express -- as of June, held nearly US$30 billion of shareholdings and owned an estimated US$14 billion in real estate properties worldwide. But more recently, the company has stood out for its debts as concerns about its ability to repay loans and bonds have driven up its borrowing costs. HNA’s earnings can’t cover its interest expenses, which according to data compiled by Bloomberg, have soared to levels topping those of any non-financial Chinese company. Its cash and earnings also fall short of the US$29 billion in short-term debt that the company faces. HNA has about 65 billion yuan in debt coming due during the first quarter, one of the people said. HNA’s overall debt, including those of its units, totals about 1 trillion yuan, with China Development Bank, which didn’t respond to a request for comment, being the group’s biggest creditor, according to the people. That’s 56% higher than the 637.5 billion yuan in short- and long-term debt the company disclosed as having as of November. HNA’s mounting liquidity woes have prompted some major lenders to consider banding together to form a committee that could exert more pressure on HNA, the people said. HNA creditors have yet to decide whether to form a creditor committee, the people said. Forming a committee is a popular strategy that creditors in China use when dealing with a borrower facing substantial difficulties. Such an arrangement may give creditors more influence in the group’s strategic decisions, including asset sales. HNA’s creditors include China Development Bank, Export-Import Bank of China, Bank of China, Agricultural Bank of China, Industrial & Commercial Bank of China, China Construction Bank Corp., Bank of Communications and Shanghai Pudong Development Bank HNA met with those eight banks in Hainan last month to discuss ways of providing credit support in 2018. The Hainan provincial government, which called the meeting, expressed its support for HNA, the people said. Calls to the Finance Affairs Office of the Hainan provincial government went unanswered.